Our technology product prides itself on sales management practices developed from hundreds of thousands of true sales situations. It automates and captures leading (not lagging) metrics e.g. funnel leakage, top funnel velocity, pipeline health etc. It analyzes and predicts from multiple vantage points: our own robust data model, your CRM data, direct customer inputs, purchasing & competitive signals, and sales team profiles. Which deals will I win? How do I know which deals will close? CRM provides tremendous value for reporting and maintaining relationships with customers, but what about prioritizing your leads? Time spent analyzing opportunities means time away from building relationships and selling. RainmakerForce analyzes historical opportunity data and understands buyer’s behaviors and helps adapt selling the process to target the close in the way the buyers perceive. Our AI learns from rep’s actions and suggests deal-specific actions to reps to drive opportunities to down the funnel. You’ve been diligent in managing your team – sales training, lead generation. Your reps on your teams spend hours updating their pipeline. But none of it seems to help much me forecast accurately. 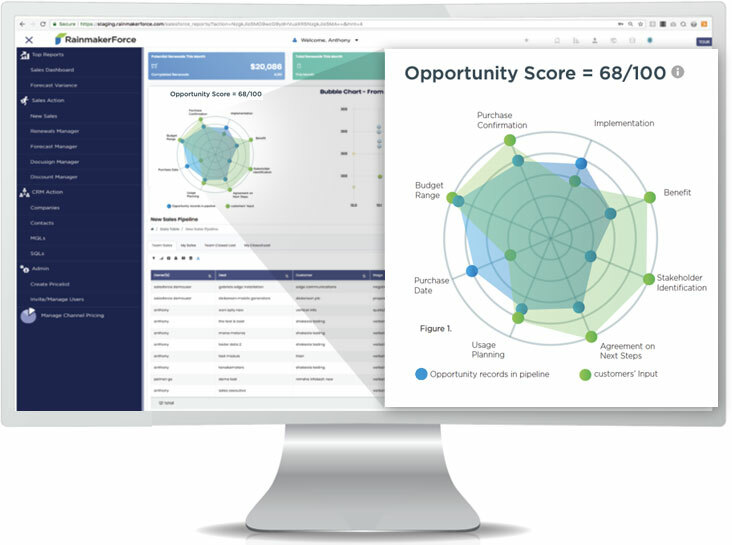 RainmakerForce accurately tracks opportunities with buyer’s perspective in each sales stage. So your pipeline won’t be just the opinions, guesses, estimates of your sales team. Our AI helps your team build high-integrity deal pipelines so that you can recover the money left on the table and stop guesstimating your sales forecasts. Prioritizing must-win deals is time-consuming, manual and ineffective. Whether you have a bloated pipeline, inaccurate opportunity records or there is not enough value in your pipeline, the challenges can be boiled down to figuring out how much of your team’s limited effort and resources should be poured into closing each opportunity. For Sales Directors, the key to prioritizing deals is to find the right balance between the level of engagement and likelihood to close, considering various risk factors. We cracked the code, based on thousands of industry rainmakers’ sales records. While sales reps’ experience, industry knowledge, personality all matters, the two biggest determinants of winning prioritization are visibility and analysis. RainmakerForce automatically analyzes pipeline data with 100% transparency. Historical data is always triangulated with current and future projections. Rep’s activity records will always help your future sales. Understand leading indicators, forecast with confidence and track money left on the table systematically with RainmakerForce. Our CRM doesn’t improve sales performance. CRM is built for Customer Relationships – for those who have already purchased or signed contracts. Salespeople deal with “Prospects” and guide them throughout their buying journey. CRM doesn’t drive sales especially each rep or sales team manages their pipeline and close differently. Selling time is lost when Sales Managers have to forecast using a combination of spreadsheets, emails and activity logs. RainmakerForce is built specifically for sales processes – it helps sales reps capture unbiased customer-verifiable data using the same selling technique that real-life rainmakers used (Yes, we interviewed thousands of them, literally). With the assurance that every customer conversation is recorded in a consistent manner, managers don’t need guesswork. Bring inconsistency and reduce variance in revenue generation. We lose deal data when the prospector rep changes. Our carefully crafted pipeline goes out the door. Harvard Business review estimates of annual turnover among salespeople run as high as 27%. Unfortunately, turnover in the sales is a fact of life. Sales rep leaves and all the information leaves with that person and leaves a hole. RainmakerForce helps sales leaders make sure the pipeline does not become a casualty of the inevitable turnover by identifying how the existed sales person was affecting the pipeline. All the detective work Sales leaders must do after the churn is much easier with RainmakerForce Pipeline Manager. Find out who the rep was talking to, what the prospect was talking about and what pieces of the turnover are worth to follow up. Channel partners don’t use the same tools we do. We can’t see their pipelines at all until they send us reports. It’s slow and inconsistent. We’re missing the opportunities to expand revenue. RainmakerForce is fast to set up - it snaps on partner’s existing CRM and gives you a full control over partner’s sales pipeline, including lead management, sales forecasting, pipeline management, price list, order processing, and partner commissions. You gain visibility into partner’s sales cycle, performance and forecasting.